The ₹ 25,000 crore capital injection for bank recapitalization in the budget has reignited the debate on whether Indian banks have enough capital. The consensus seems to say no. 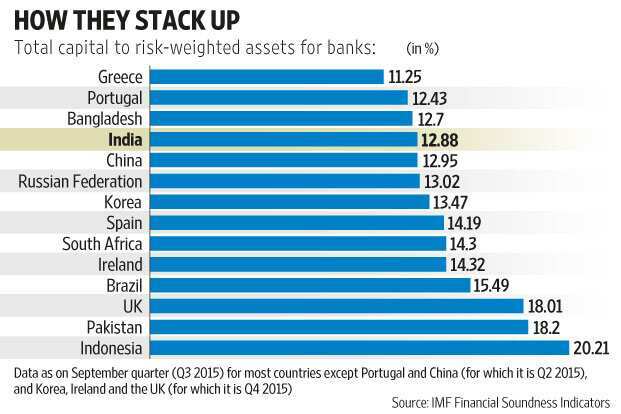 While collectively, banks do meet minimum capital adequacy norms, a look at the chart shows how poorly India fares when it comes to this yardstick of financial soundness, expressed as a ratio of capital to risk-weighted assets. At the end of September, Indian banks’ capital adequacy ratio was better than that of those in just a handful of countries such as Greece, Portugal and San Marino. Banks in countries such as Brazil and Indonesia, leave alone Spain and the UK, also did much better. To be sure, capital comes at a cost. “Too high a capital adequacy requirement could act as a fetter for credit growth," says Hemindra Hazari, an independent banking analyst. “In emerging economies, debt markets are underdeveloped and banks may be the sole agency for credit." But Indian banks have reported a relatively low capital adequacy ratio at a time when there is a danger of non-performing assets still piling up and causing credit growth to slacken. As credit rating agency Moody’s Investors Service pointed out in a post-budget note, “Increased recognition and provisioning for non-performing loans (NPLs) will require a corresponding front-ending of capital requirements, which suggests that capital constraints will remain a key credit weakness for public sector banks." Post-budget, the Reserve Bank of India’s (RBI’s) change in rules has released some capital into the banking system. But as this column has pointed out, that is no more than a band-aid solution. Moreover, as RBI completes its audit of all banks by the end of this month, expect more skeletons to tumble out of the closet. Credit Suisse AG expects that the ratio of stressed loans (including restructured loans) could climb up to as high as 18% of loans, reports Bloomberg. The International Monetary Fund estimates that in case of “a severe scenario of continuous deterioration of state-run banks’ asset quality on a scale commensurate with their recent experience", recapitalization costs would amount to 2.9% of FY2019 gross domestic product (GDP), assuming slow credit growth. In case, credit growth picks up to 1.1 times GDP growth, the costs rise to 3.24% of FY19 GDP. The bottomline: at this level of capital adequacy, banks are sorely underprepared for a bounce in credit growth when it happens. Thus, undercapitalization too can act as a fetter to bank credit growth.